The concept of endemism, as it pertains to ecologists (and birders are nothing if not amateur ecologists), is tossed around somewhat carelessly. Seemingly simply put, it’s a reference to a species found in some sort of defined zone be that as well defined as an island in the ocean or as nebulous as a patch of special habitat. As birders we often refer to endemics on a national scale; so-and-so country has 15 endemics and so on. This has as much to do with the tourism trade as anything, big listers are more likely to pump money into a country’s ecotourism coffers if there’s something there that can’t be had anywhere else on earth. And that’s fine, but somewhat misleading as this sort of endemic labeling owes more to arbitrary political boundaries as anything else, and we all know that birds are famously non-beholden to those. The term is better used to refer to ecosystems, whose boundaries in the eyes of non-humans are as stark as the Korean DMZ or the Tijuana border crossing and defined by less obvious characteristics like soil and water and altitude. But I threaten to turn this personal pedantic sticking point into a wild tangent if I go on too long here. What I really mean to say is that endemics get a lot of attention elsewhere, but the United States of America hosts our own endemics, though we rarely think of them as such. 15 of them in all (if you don’t count Hawaii which, ecologically, is its own fascinating deal), 7 of which have the entirety or the near entirety of their home range in the southeastern corner of the country. This number includes well-known and common species like Carolina Chickadee, Fish Crow and Boat-tailed Grackle, as well as species of special concern like the endangered Florida Scrub-Jay and, the bird I want to discuss here, the Red-cockaded Woodpecker, little Picoides borealis. Woodpeckers in general are a pretty popular group among birders; it’s hard not to love the whole head-banging clan. But even among the singularly charismatic group, the RCW, the handle given to it by its Fish & Wildlife Service protectors, is unique. Despite the fact that their latin species name, borealis, literally translates to “of the north”, they’re obligated to a very specific type of habitat, a southern pine savanna, managed by regular burns – either controlled or natural – and represented by a certain suite of plant species either dependent on or highly resistant to fire, species like Longleaf Pine (Pinus palustris) and Wiregrass (Astrida stricta) among others. I’ve mentioned before the special nature of this ecosystem, as well as the issues, the usual suspects of agriculture and development with a side of fire fear, that have led to its fragmentation into localized and widely distributed patches across the southeast. As you might imagine, for a non-migratory, slow-breeding, habitat dependent species, this is not so good. The characteristics that make the RCW so uniquely suited for this special place also make it difficult for it to deal with the rapidly changing south. 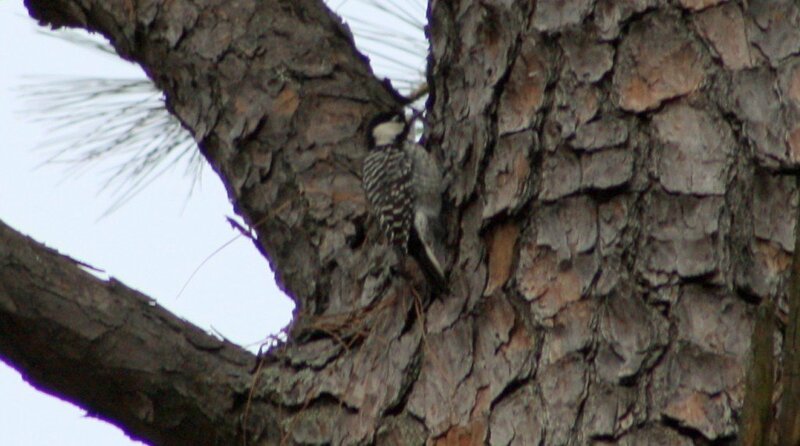 For starters, while other woodpeckers drill nesting cavities in snags or, at the very least, trees well on their way to snagdom, this one the only woodpecker in the world known to drill nesting cavities in living trees. There’s a very good reason for this little adaptation. The Pine Barrens are home to a particularly insidious predator, a powerful 8 foot long constrictor known appropriately as the Pine Snake (Pituophis melanoleucus). To protect its nest from marauding serpents, the RCW will drill holes in the tree around the nest hole such that the pine oozes resin, sticky sap that covers the bark creating a natural glue trap for any would-be predators. None but the most dedicated snake stands a chance. The resin covered trees, especially those that have been in use for several years, certainly stand out too, glowing an otherworldly silver among the normal pines. In fact, one of the easiest ways to find RCWs in the summer is to drive the dirt roads through the Sandhills looking for a discolored tree in an otherwise normal looking forest. But this effective predator deterrent has its costs too. To create this sticky trap, the tree has to be alive. But the wood of a live tree is a difficult thing to work with, such that a RCW cavity can take up to seven years of diligent effort to excavate, a significant amount of work to be done before a male on territory can even begin to advertise for a mate. Because this process is so expensive in the way of energy investment, the birds tend not to spend a lot of time expanding home ranges, preferring to sit tight and defend already excavated nest sites rather than expand into new territories and excavate new holes. The competition for these sites is fierce, and nest sites are often passed down the paternal line through several generations with male siblings sticking together and communally raising their male parent or dominant brother’s offspring. This sort of familial cooperation is not necessarily unusual among Picids, Acorn Woodpeckers in the American west are known to do it too, but it’s a unique adaptation to the limits that intensive excavation in living trees places on dispersal. It’s much easier to fight over a old hole than spend years creating a new one. As you might imagine, this makes RCWs a challenge for FWS and state agencies tasked to protect them. If RCWs are extirpated from a site they historically occupied they’re extremely unlikely to come back, even if the habitat is restored, because they’re loathe to leave the cavities they’ve invested so much time and energy in. In recent years, however, it’s been discovered that they’ll take to artificial cavities pretty readily. 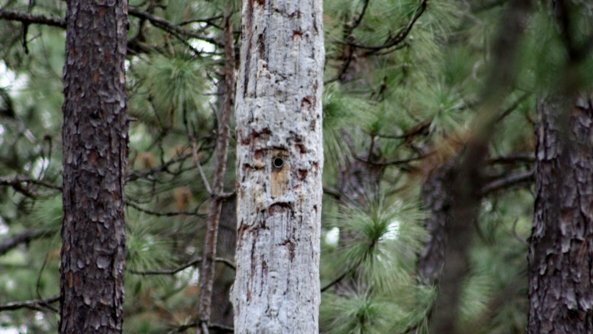 Managers in RCW territory can drill a hole in a pine tree, place an artificial cavity, not unlike a bluebird box, completely inside the tree and drill some holes around it to get the sap flowing, and the Woodpeckers will re-colonize abandoned portions of their range as if they never left. In fact, in the photo of the RCW cavity above, you can clearly see the outline of a nest box smack in the center of the sappy moat. Using this method, the state wildlife commission in North Carolina has been able to increase RCW populations in the state such that North Carolina birds are often used to supplement clusters of RCWs throughout the rest of their range. It’s a real success story, and despite the continued fragmentation of the pine savanna habitat throughout the greater south, hopefully there will continue to be places with healthy populations of this all-American endemic. I always tell people that every bird is endemic to its range. Ontario really messes up the notion of US endemism! Very interesting post Nate. I didn’t realize that RCW drill holes about the nest cavity hole to let loose sap as a predator deterrent, so thanks for bringing that to me attention. Also, just wanted to say that I agree completely that endemism is word thrown around too liberally. Ultimately, it is practically meaningless when it stands alone and must be qualified somehow to be useful. Great post! I’m enjoying your series on southeastern habitats and their birds. @Rick- Thanks! Ontario is a province of cruelty for US endemics. There has to be another dozen or so species that barely tick across the border there. @BirdOasis- Yes, I’ll try to avoid too many endemism rants (not even going into how the definition differs with regard to epidemiology, a long argument I had with my epidemiologist father-in-law until we realized that context matters), but it always bothers me when tourism companies will say a country like Guatemala, for instance, has no endemics when of course it does, it just shares the volcanic highland region of high endemism with Mexico. But I digress…. Thanks for the kind words! @John- Thanks! I hope I don’t run out of them anytime soon! Great post. As you say, birds don’t know about political boundaries (except the central american Melodius Blackbirds that still don’t want to enter Panama)! A very well done post Nate. Thanks for sharing your personal knowledge and experience about the RCW.